Tomorrow at noon (Pacific) Willa Koerner, our social media genius, and I are hosting SFMOMA’s first-ever crowd-sourced public program: we’ve invited five contributors to our Art Microhubs Tumblr project to join us online to talk about the relationship of smaller arts organizations to their local communities. Why do these places matter? To whom? Our guests are a very interesting, various group of people running spaces in places from Oakland to Jamaica. We’ve asked them to tell us about their organizations, what kind of impact they’ve had on their communities, and why they’re crucial. We’ve also invited them to discuss the impact these kinds of spaces have when they’re in a smaller town vs. a bigger, culture-rich city, and what, if anything, big institutions like SFMOMA can or should do to help further their reach. 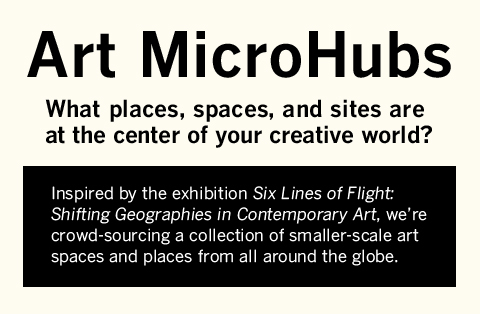 We also plan to ask our guests what they think we should do with the Art MicroHubs Tumblr project. To join the conversation, submit questions or comments by tweeting @SFMOMA with the hashtag #ArtMicroHubs or emailing SFMOMAsays@sfmoma.org.